Here are our recommendations for the best Minnesota Fishing Resorts and Grand Rapids MN Area Businesses. Little Winnie Resort is a year-round family fishing resort with 11 housekeeping cabins and 134 RV seasonal and short term campsites to choose from. From the resort anglers have immediate access to outstanding fishing on Little Winnie Lake as well as boat, motor, pontoon and spear house rentals and bait, gas and tackle sales. Big Lake Winnibigoshish is just a quarter mile away. The Pines Resort & Campground is a top Minnesota walleye fishing resort. This angler’s paradise offers 12 housekeeping cabins and 13 campsites and is located just north of the Mississippi River Dam on Lake Winnibigoshish. At The Pines Resort you’ll find everything you need to have a great Minnesota fishing vacation including boat and motor rental, a concrete boat launching ramp, live bait, tackle, gas, oil and individual boat slips. Open year round with ice fishing and ice house rentals available. Our pick for Minnesota Family Resorts is Eagle Nest Lodge. It caters to anglers and their families with modern accommodations and great fishing on Lake Winnibigoshish. Located on the north shore of Cutfoot Sioux Lake this 15 cabin resort offers year round angling opportunities as well as amenities like boat, motor and pontoon rentals; gas, tackle and live bait sales; ample dock space and battery charging. Anchor Inn Resort – Anchor Inn Resort is a Minnesota fishing and family resort located on Little Sand Lake and the Bowstring River near Max, Minnesota. There are 9 seasonal cabins, 6 Bed, Breakfast and Boat lodge rooms and a campground with full RV hookups. Anglers love to fish from the bridge just steps away from the lodge and have made Anchor Inn Resort a Minnesota fishing destination since the early 1920s. Guests appreciate modern conveniences like in-cabin wireless internet, cable tv and air conditioning. This Minnesota fishing resort also offers boat, motor and pontoon rentals as well as gas, oil and live bait sales. Geiger’s Trails End Resort – Geiger’s is a year-round family resort nestled in the Chippewa National Forest. It features eight clean and comfortable lakeside vacation homes on the shores of Bowstring Lake. Come fish the famous walleye, northern and panfish waters of Bowstring Lake, relax in our large lodge or on the deck and enjoy a true up north Minnesota vacation. 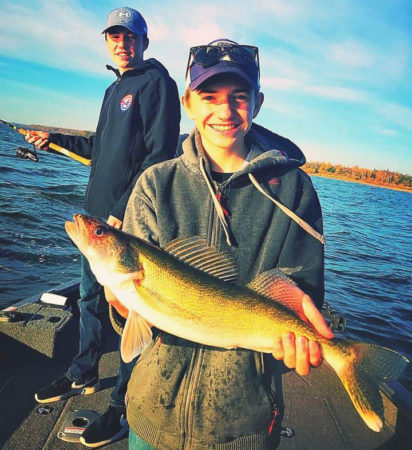 The Lake Winnie Area Resort Association – Minnesota’s Lake Winnibigoshish is the perfect fishing destination and family vacation with sand beaches, walleye, jumbo perch, northern pike, muskies & more! Lake Winnie is not only a fantastic fishing destination, but is the perfect “Up North” Minnesota family vacation getaway! Click the link to view the Lake Winnie Association website for more information on planning your next Minnesota fishing resort vacation, reunion, corporate retreat or sales meeting at Lake Winnibigoshish. Moose Lake Wild Rice – Buy Minnesota Wild Rice on their website as well as other Northwoods gift items. Their wild rice is the best. Family Dentists in Grand Rapids, MN — Grand Dental Center – Grand Rapids dentists Dr. Lisa Johnson and Dr. Leanna McBride provide a complete range of dental services, from basic preventive care to cosmetic procedures and restorative dentistry. Their friendly and competent team provide the highest quality of dental services in a professional, gentle, and caring atmosphere. From cleanings and exams, crowns, veneers, dental fillings, dentures and partials to dental implants and invisalign, Grand Dental Center does it all. MN Fishing Guides – Royal Guide Service – Offering full and half-day guided fishing trips for over 15 years, Roy Girtz of Royal Guide Service guides for walleye, northern pike, muskie, bass, crappie, bluegill, perch, lake trout and sturgeon on all the lakes and rivers in north central and northeastern Minnesota. Guide trips include professional series boat and motor, fresh bait, premium equipment, fuel, safety equipment, and a knowledgeable, friendly guide. You need only bring your Minnesota fishing license, snacks, beverages, sunglasses, rain gear and a camera. If you’re looking for a Grand Rapids MN Fishing Guide, other than me of course, give Roy a call today at 218-259-8992. Brewed Awakenings Coffee Shop & Cafe – This popular coffee house and cafe in downtown Grand Rapids is known for espresso drinks, premium coffees and teas, and delicious breakfast, lunch and dinner items made with fresh farm-to-table ingredients and served by gracious staff. Don’t forget to try their awesome deserts! Glen’s Army Navy – The Outdoor Store for Clothing, Footwear, Fishing, Hunting, Ammo & Shooting Supplies, Camping & Outdoor Gear – Find everything you need for working and playing in the great outdoors at Glen’s Army Navy Store in Grand Rapids, Minnesota. Homes For Sale near Grand Rapids MN – MN Direct Properties – If you’re looking for homes for sale in Grand Rapids or northern Minnesota, contact Todd Stone and his realtors at MN Direct Properties in Grand Rapids, MN. We’ve worked with them in the past and their customer service and attention to detail are unequaled. Whether buying or selling, you’ll be happy with their real estate knowledge and marketing. Visit their website or give them a call at 218-326-5800. Veterinarians in Grand Rapids – Grand Rapids Veterinary Clinic is the best veterinary clinic in Grand Rapids and the region with five great doctors and a skilled and caring support staff. They provide a wide range of medical, surgical, and dental services for dogs, cats, and other small pets, as well as boarding services for dogs and cats. They use the latest technology and take time to answer all your questions. They’re even AAHA (American Animal Hospital Association) certified. Give them a call at 218-326-0395 or visit their website to make an appointment. Gosh Dam Place – This unique motel, restaurant and bar has it all – location, accommodations and great food! Located just one mile east of the Mississippi River Dam on Lake Winnibigoshish, the Gosh Dam Place offers anglers accommodations, (10 motel units and 11 sleeping rooms) a restaurant and bar, off-sale liquor and a convenience store. Serving breakfast, lunch and dinner seven days a week. Miskovich Dental Clinic – Miskovich Dental Clinic P.C. and Doctors Peter Miskovich and Mike Miskovich offer cosmetic, restorative and preventive dental services designed to give you a healthier and more beautiful smile. You’ll find a friendly, knowledgeable team ready to provide you and your family with the best quality dental care and treatment in a comfortable, informative and respectful manner. E3 Consulting Services – E3 Consulting Services is a web design and development firm specializing in search engine marketing (SEM), search engine optimization (SEO), social media management, and internet marketing services. Located in Grand Rapids, Minnesota, they also provide a full range of traditional advertising, marketing consulting, media relations and public relations services.